I was excited to get a chance to check out the fairly new Yao Family Wines tasting room located off Highway 29 in Saint Helena. If you are or aren’t a basketball fan, you would recognize Yao Ming. Standing a staggering 7ft 6in, Yao Ming played for the Houston Rockets for almost a decade, retiring in 2011 at the ripe old age of 31. What you probably don’t know about Yao Ming is his passion for wine and humanitarianism. Yao’s passion for wine is so strong that he decided to get into the business of winemaking here in Napa Valley. Teaming up with veteran winemaker Tom Hinde, Yao began to make wine in 2009, focusing on Cabernet Sauvignon. Straight out of the gate; The 2009 Yao Ming Family Reserve Napa Valley Cabernet Sauvignon received 97 points from Robert Parker. With a huge following in China, the Family Reserve Cabernet sold for $600 U.S.,$1200 in China, and sales were healthy. After rethinking the Chinese market on wine and switching up the business plan, Yao Family Wines now has separate labels catering to Chinese tastes, lifestyle, and budget and two labels here in the tasting room, Napa Crest, and Yao Ming. In February of 2016, Yao Ming Family Wines took over the old Bella tasting room in St. Helena next to Gott’s Roadside. Currently, they have four wines to taste, a Sauvignon Blanc, a Bordeaux blend and two Cabernet Sauvignons. 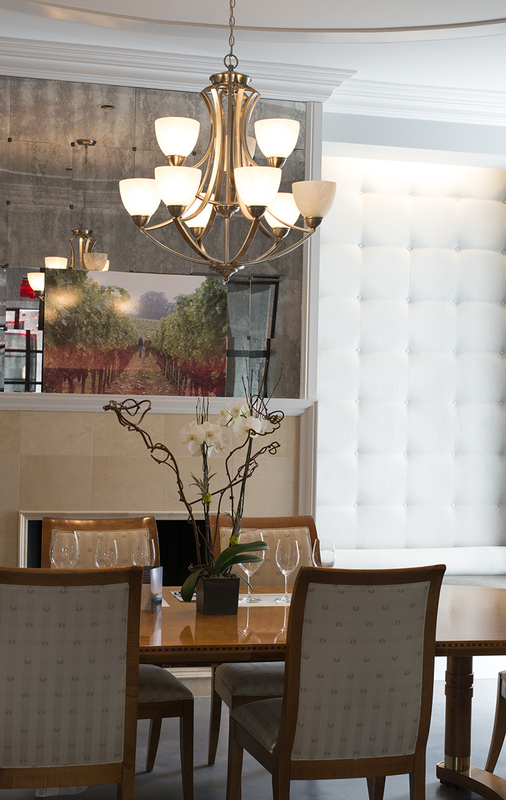 Walking into the tasting room, I immediately appreciated the large, modernistic space known as the Quartz Tasting Bar. John, Director of Consumer Sales, graciously greeted me and we got down to business. He took me over to the area of the tasting room that showcased Yao Ming’s other passion, humanitarianism. Yao Ming is an advocator of wildlife conservation, producing limited-edition, commemorative bottles, in which all profits benefit WildAid. As global ambassador to WildAid, he is credited with reducing Shark fin soup consumption in China by 85%, keeping the shark population from becoming endangered. He also supports Special Olympics and started the Yao Ming Foundation, which helps victims from the 2008 Sichuan Province earthquake and supports education in both China and the United States. While keeping busy with humanitarian issues, Yao Ming decided to ease into the wine industry. 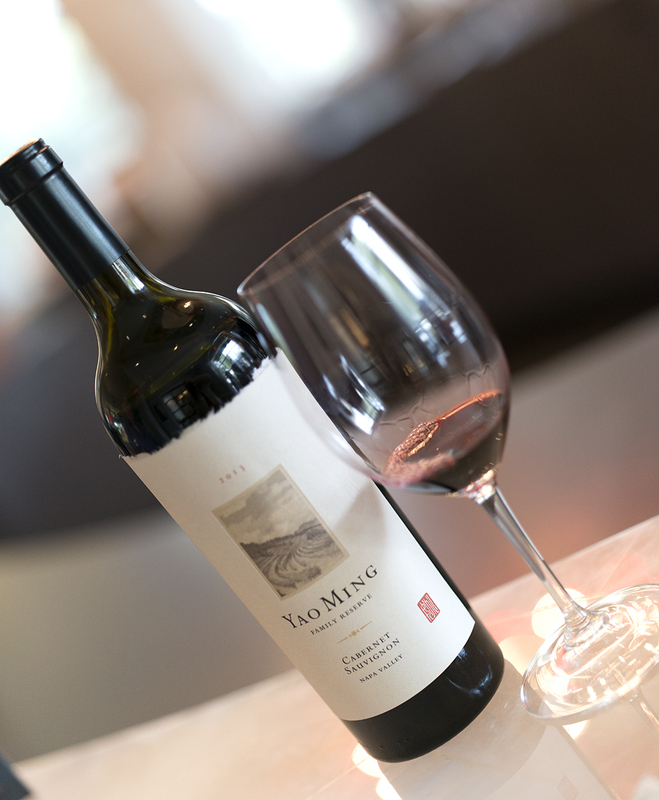 Starting slow and feeling out the markets, Yao Family Wines began with the 2009 Yao Ming Napa Valley Cabernet Sauvignon and the 2009 Yao Ming Family Reserve Napa Valley Cabernet Sauvignon. Yao Family Wines have now expanded to include a Bordeaux blend and a Sauvignon Blanc which I was about to try. The 2015 Napa Crest Sauvignon Blanc, new this year, is part of the Napa Crest label which also includes the Napa Crest Bordeaux blend. This wine is 92% Sauvignon Blanc and 8% Semillon, with all the Sauvignon Blanc tank fermented and the Semillon barrel fermented in neutral oak, giving this wine an excellent balance of acidity, crispness, and roundness. It is priced nicely at $32. I enjoyed the tropical aromas of lychee and banana and flavors of lemon and peach. The well-rounded mouthfeel of the Sauvignon Blanc, was a pleasant surprise, being that I’ve tasted many Sauvignon Blancs lately that are based solely on stainless steel fermentation. While sipping on my lovely Sauvignon Blanc, I perused the other tasting areas, Bar Two, Club Member Lounge, Family Table and Yao Ming Lounge. 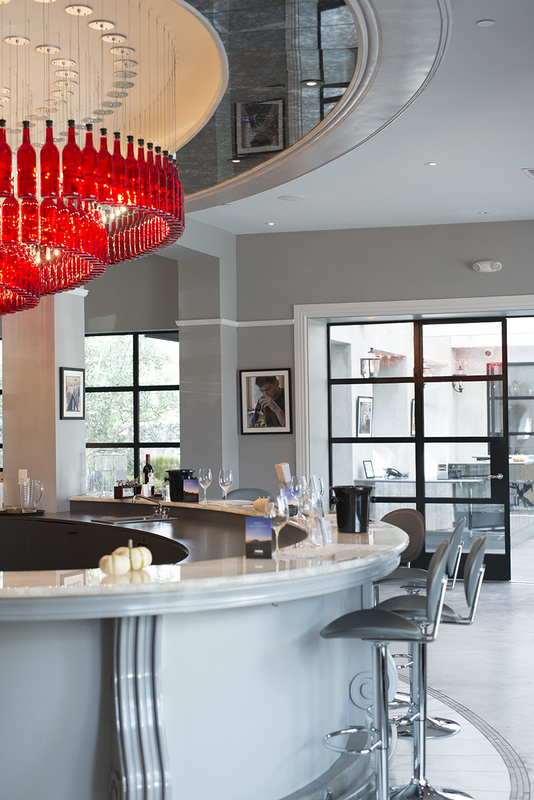 “Bar Two” was a large space with another bar and seated areas that can accommodate larger groups. 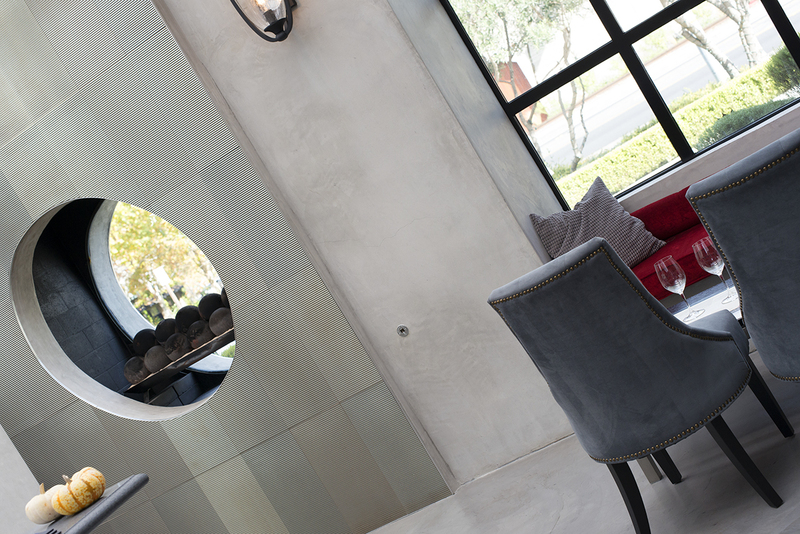 Showcasing the area is a circular gas fireplace built into the wall, transparent to the outside. Vibrant colors of red accent the predominantly concrete interior, giving it a delightful contrast. The Club Members Lounge was cozy and intimate, with a large fireplace, flanked by comfortable seating and original artwork. 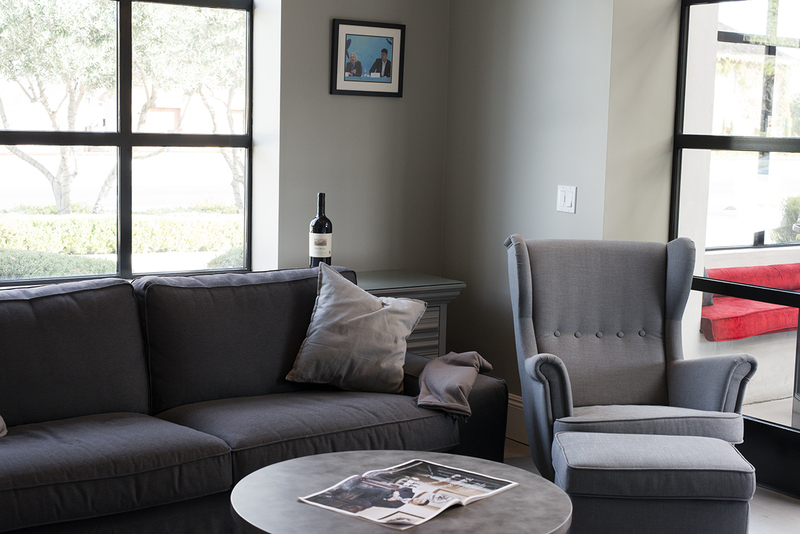 Members can enjoy a glass of wine and a toasty fire. The Family Table area caters to parties up to ten people and features a large table ideal for socializing. Out the back of the room is an additional outdoor space. Toward the back of the building, is the Yao Ming Lounge, a bright space with stylish seating, Yao Ming’s favorite room when he attends parties, his Beijing Olympic jersey is displayed nicely on the wall. I was surprised that the tasting room was so large and versatile with all these different spaces. Yao Family Wines also caters to far east visitors, providing a full-time Mandarin-speaking Tasting Room Associate. After my mini tour of the building, I was back at the Quartz Bar to taste the 2014 Napa Crest Red Wine, a Bordeaux blend consisting of 63% Cabernet Sauvignon, 25% Merlot and 12% Petit Verdot. With 50% new French oak in barrel for 16 months, I recognized a lot of vanilla on the nose. I haven’t had many 2014 Cabernet blends since most aren’t released yet, but it was fun to try the new vintage, and it seemed to have a lot of spice, cherry but wasn’t too tannic for its age. This blend is showing great potential, maybe not as explosive or showing the tannic backbone that 2013 had but enjoyable in a completely different way. The Napa Crest Red Wine sells for a resonable $48. Moving on to the Yao Ming label, I was poured the 2013 Yao Ming Napa Valley Cabernet Sauvignon. 91% Cabernet Sauvignon, 5% Merlot, 2% Cabernet Franc and 2% Petit Verdot, this wine consists of fruit from St. Helena, Rutherford, Oakville, and Yountville. Hints of blackberry, cherry, and plum encompass this wine, tannins are smooth and not overwhelming but still structured enough to age well. This Cabernet sells for $85. Yao Ming teamed up with winemaker Tom Hinde and started with the Yao Ming Cabernets in 2009. Tom Hinde’s resume includes CEO and Director of Winemaking at Flowers Vineyard and Winery, General Manager for Kendall-Jackson, as well as La Crema and over 30 years of experience from cultivation, to management and winemaking. 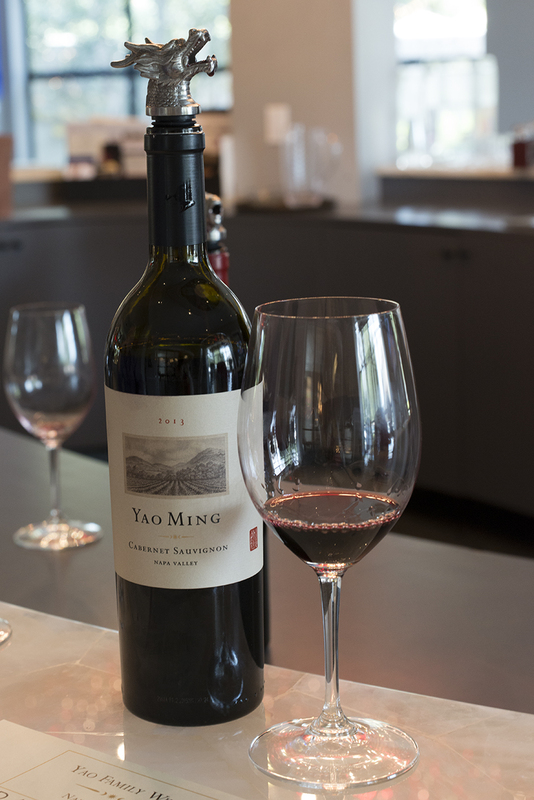 Our final wine was the flagship 2013 Yao Ming Family Reserve Napa Valley Cabernet Sauvignon. Scoring 92 points from Wine Enthusiast; this wine continually scores well with the critics since its inception. With 96% of some of the valleys best Cabernet fruit, 2% Petit Verdot, 1% Merlot and 1% Cabernet Franc, this wine was smooth, velvety and well balanced with beautiful fruit, blackberry and baking spice. With only 80 cases of fine Cabernet, the price tag on this wine is not for the faint of heart. At $225 a bottle, this would be one you want to cherish. With that said, I did walk out with a bottle of the Family Reserve Cabernet Sauvignon. What is fun about this winery is that it is in its infancy, but the wine that is being made is not. With 4500 total cases made for domestic sale, these are low producing; handcrafted wines that are carefully cultivated. Because this is a new winery, it’s a good one to visit and revisit to see how the wines have changed and evolved.